Confused about transgenderism? Nick and Mel want to sing you some songs, this Saturday at the Fair. While the Bruce Jenner story leaves many confused, Nick & Mel, a music and comedy duo, try to demystify transgenderism by breaking it down into song. “Our music is unapologetic acerbic androgyny,” says Nick Walker, a transplanted transgender San Diegan from Brooklyn who used to identify as female. Walker is currently reassigning as a male. And talking (or singing) about it is not off the table. 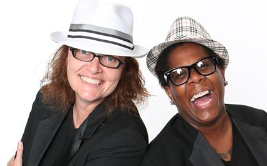 Partner Mel Peters, “is a super-tall, super-nice lesbian.” They both play guitars, sing, tell jokes, and do skits. The duo was invited to be part of the San Diego County Fair’s “Out at the Fair Day” on Saturday, June 13, a day’s worth of entertainment by and for the lesbian, gay, bisexual, transgender, and queer (LGBTQ) community. Nick and Mel released an album, Live in the Key of Divorce, that makes light of gay divorce. The songs move from the dramatic (“Drain Me,” “Come and Get Your Stuff”) to the more camp (“Weiner Fight,” “Fanny Pack”). Echoing Olympic gold-medalist Jenner — this month gracing the cover of Vanity Fair magazine as a woman — Walker says, “This is who I have always been... It’s beautiful for Bruce that at 65 he can finally be himself. I know lots of people who do this later on in life,” says Walker, 38. Nick and Mel appear at the Fair this Saturday at 3 p.m. on the Paddock Stage.